If you use Dropbox and Google Chrome, you can now easily access your Dropbox files from the Chrome browser. 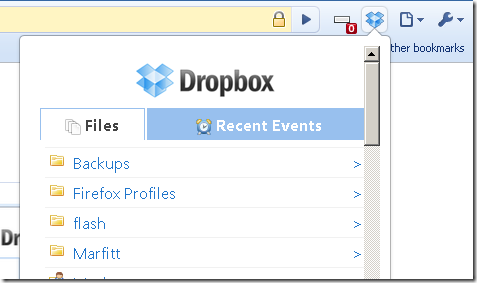 Dropbox extension for Google Chrome is a free and unofficial extension for accessing your Dropbox files. Once installed, the Dropbox extension adds a small Dropbox icon on your Chrome toolbar. You click on the icon and enter your login credentials. You will now get a dropdown window with 2 tabs – recently updates files and your folder structure to navigate to your files. You can click on any file to view on the browser or download it to your computer. i love how Dropbox is ubiquitous and is made accessible in so many ways. Check out our Dropbox hacks collection and portable Dropbox to take it with you. Thanks for sharing. I’ve been using Dropbox for quite sometime now but i never really knew that there’s an extension for it in Google Chrome. Thank you once again for sharing. This would come in handy.